The vista along Northbourne Avenue is beloved by Canberrans, despite the fact that they only see it out of the side windows of their cars. It is one of the remaining Burley Griffin design elements that can legitimately be pointed to in the 21st Century. What will happen to the eucalyptus tree along its median strip when light rail runs down the length of Northbourne Avenue? 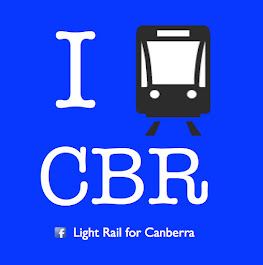 The ACT Government announced in January 2015 that they had identified a more suitable species to replace the existing gum trees, following the construction of Capital Metro. This is part of the consultation process that Capital Metro are engaging in to determine the design and form of the route. 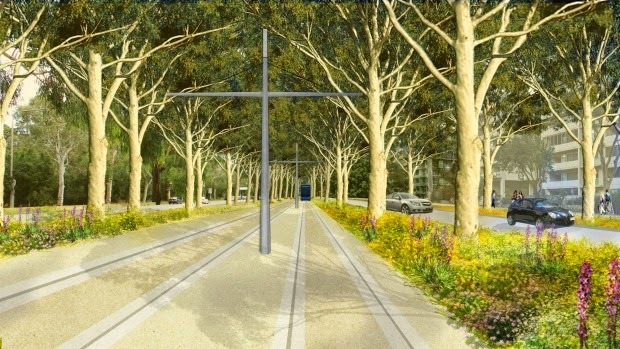 Northbourne Avenue's failing River Gums look set to be replaced with Eucalyptus rossii and year-round plantings of wild flowers as part of the light rail development. The ACT Government will recommend the species, also known as as Scribbly Gums, to the National Capital Authority as the replacement for hundreds of existing trees set to be cut down as construction begins in 2016. Mr Corbell said the river gum was a poor choice of tree for Canberra's main thoroughfare and that scribbly gums were a better choice. "It's very prone to falling over, even in modest winds, it's got a very shallow root structure," he said. "We're looking to replace the trees with scribbly gums, a good local tree which is better suited to the Canberra environment." He said scribbly gums grew at a similar height to the existing trees, which would help maintain the well-known look of the entrance to Canberra. "The Government's also experimenting with to what extent we can put in place semi-mature plantings as a way of restoring the landscape quality of Northbourne Avenue as promptly as possible," he said. The current consultation focuses on Northbourne Avenue because any design concepts need to be signed off by the National Capital Authority prior to the proposal stage. Finding a suitable tree species for Northbourne Avenue is harder than it might sound. Since 1913, we have selected and planted three generations of trees including the Eucalyptus Elata (River White Gum), Eucalyptus Camaldulensis (Red Gums), and Pinus Radiata (Californian Pines). All three previous generation of trees have struggled due to unsuitability for the Canberra climate or pest infestation. As a result of drought conditions and early intense irrigation, many of the trees remaining on Northbourne Avenue are in decline and will need to be replaced in the near future regardless of the light rail project. Following this process the Eucalyptus Rossii (Scribbly Gum) has been identified as the most suitable species. The Scribbly Gum was the only species out of the four analysed that ticked all the requirements. It is native to the Canberra region, has a high tolerance to drought and frost and has a proven record of successful growth in the urban areas of Canberra.